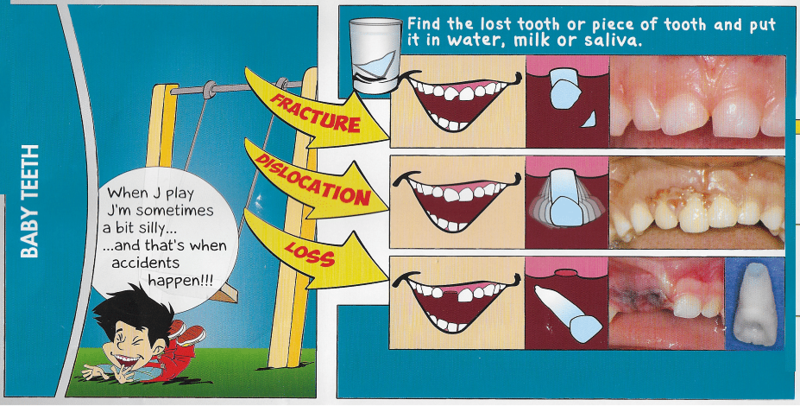 Dental trauma in children is extremely common. There are two peak risk periods for dental trauma – the first between ages 1-3, when environmental exploration begins, and the second being the preadolescent/adolescent period, when children become active in sports. Some common causes of toothache include: tooth fractures, decay, infection, trauma, and wisdom teeth eruption (adolescence). Impacted food can also cause discomfort in young children. For mild chipping of the teeth (up to 2mm), if there is no bleeding from the tooth itself and your child is not in pain, your child can generally be seen within a few days to have the tooth evaluated. If the tooth is loose, displaced, or has broken more than 2 mm, or if you note bleeding from the tooth, and or your child is in pain, contact your dentist. If the child’s cheek, lip or tongue is bleeding due to an accidental cut or bite, apply firm direct pressure to the area using a clean cloth or gauze. To reduce swelling, apply ice to the affected areas. If the bleeding does not stop within 15 minutes or if it becomes uncontrollable, proceed to the A&E or call a medical professional immediately. 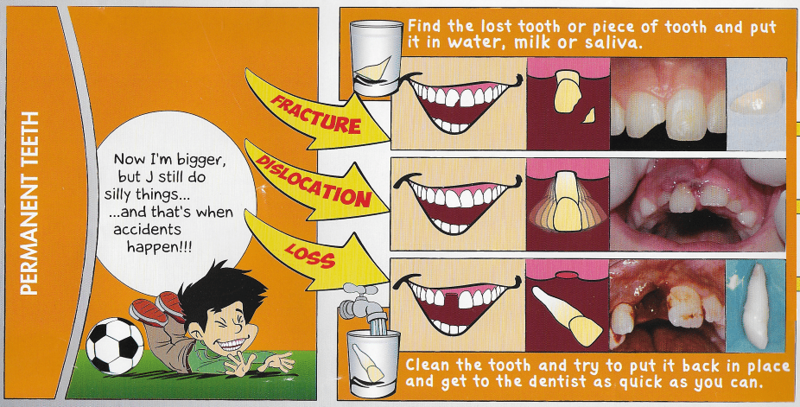 If a broken or fractured jaw is suspected, proceed immediately to the A&E. In the meantime, encourage the child not to move the jaw. In the case of a very young child, gently tie a scarf lengthways around the head and jaw to prevent movement. If the child has received trauma to the head, proceed immediately to the A&E. Even if consciousness has not been lost, it is important for pediatric doctors to rule out delayed concussion and internal bleeding.